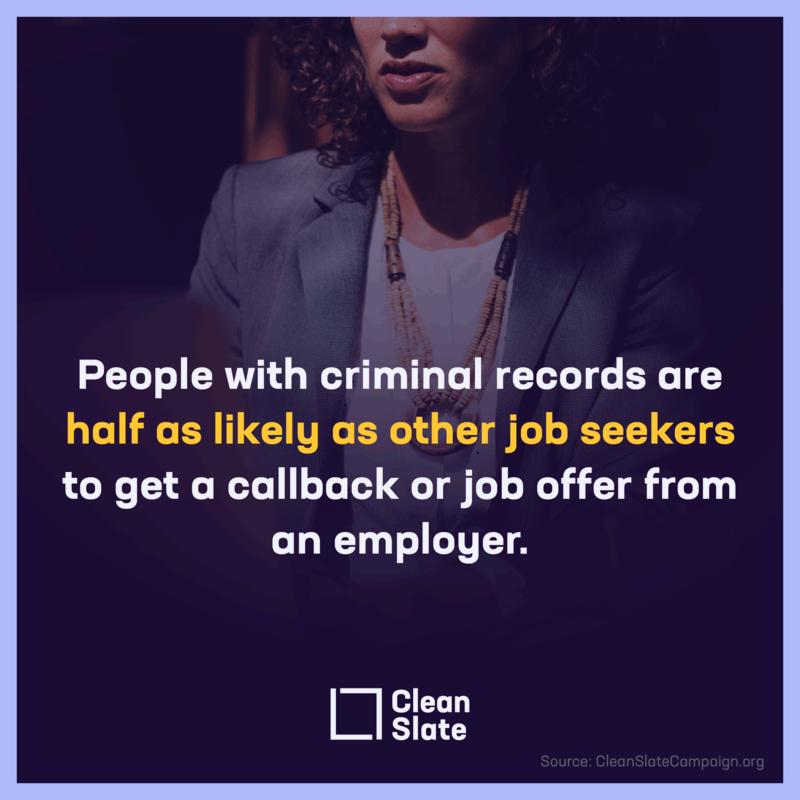 Clean slate is a policy solution that automatically clears criminal records and gives people the second chance they’ve earned. Following decades of overcriminalization in the United States, between 70 million and 100 million—or 1 in 3—Americans now have some type of criminal record.1 While felony convictions carry perhaps the greatest stigma, even a minor record can be a life sentence to poverty in the digital era, with nearly 9 in 10 employers,2 4 in 5 landlords,3 and 3 in 5 colleges4 now using background checks to screen applicants’ criminal records. 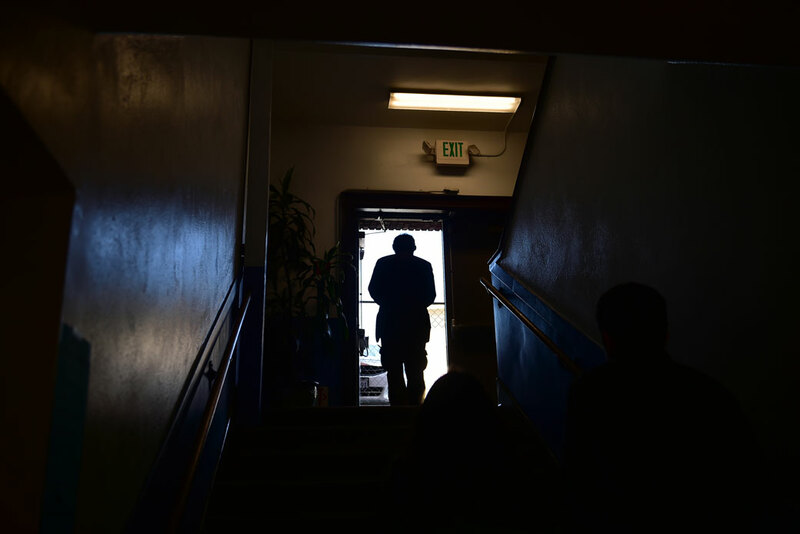 Unfortunately, under the current petition-based system, only a tiny fraction of people eligible for expungement or sealing ever obtain the relief they need—a problem known as the second chance gap. Navigating the complex record-clearing process can prove extremely challenging, often requiring expensive legal assistance and court fees—making it impossible for millions to move on with their lives. Fortunately, a new policy known as “clean slate” offers a solution: automatic record-clearing once someone remains crime-free for a set period of time. Justice-involved people and their families will be able to earn a decent living, obtain stable housing, and access the education and training they need to get ahead. The criminal justice system will not be burdened with the transactional costs of record-clearing petitions, reducing a burdensome workload for the country’s overtaxed courts. States will save taxpayer dollars as a result of reduced incarceration, as the path to re-entry is smoothed. The economy will benefit as qualified job seekers are able to re-enter the labor force. Communities will be safer due to lower recidivism rates as more justice-involved people are able to move on with their lives and provide for their families. Following decades of overcriminalization, between 70 million and 100 million Americans—1 in 3—now have some type of criminal record. 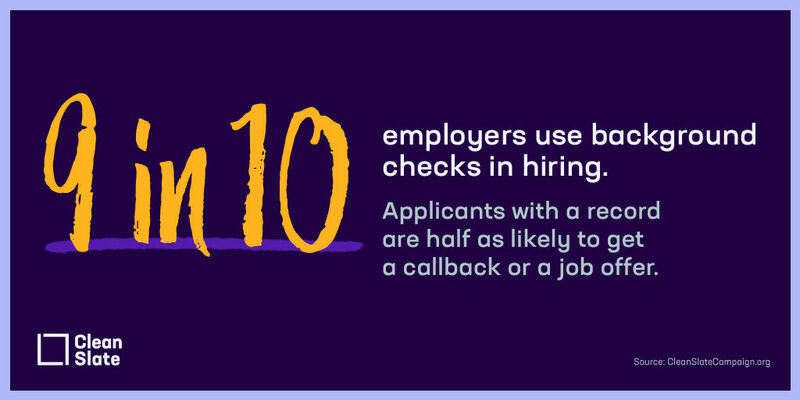 But in the digital era, with nearly 9 in 10 employers, 4 in 5 landlords, and 3 in 5 colleges now using background checks, any record—no matter how old or minor—can put employment, housing, education, and other basics permanently out of reach. As the use of background checks has grown, so has the number of laws and restrictions limiting access to jobs, occupational licensing, credit, housing, education, and other basics. People with records potentially face some 50,000 such restrictions. Nearly half of American children now have at least one parent with a criminal record. People with criminal records who have remained crime-free for four to seven years are no more likely than the general population to commit a new crime. A clean slate helps people move on with their lives and get back to work. Research from the University of Michigan finds that people are 11 percent more likely to be employed and are earning 22 percent higher wages one year after a record has been cleared. Millions of justice-involved people are eligible to have their records cleared through expungement or sealing. But the vast majority don’t ever get relief, because they can’t afford a lawyer, pay the court fees, or figure out how to navigate the complex court petition process. Many are not even aware it’s an option. Clean slate uses technology to streamline the existing record-clearing process so more people with records can get the second chances they’ve earned. Clean slate automatically seals or expunges qualifying records for people who remain crime-free for a set period of time, taking the burden of filing a court petition off the individual and lessening the strain on the courts. 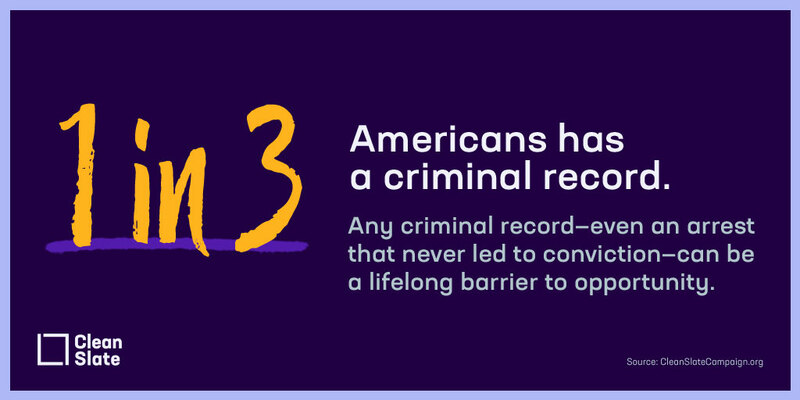 Enabling people with records to earn a clean slate will smooth the path to re-entry, reducing the likelihood of recidivism. That means safer communities, fewer people behind bars, and fewer taxpayer dollars wasted on unnecessary incarceration. Pennsylvania’s bipartisan Clean Slate Act, which was signed into law in June 2018, passed with 81 percent support among Pennsylvanians13 and the support of a diverse coalition that brought together the left and the right, as well as directly impacted communities, business, law enforcement, and even the Philadelphia Eagles. 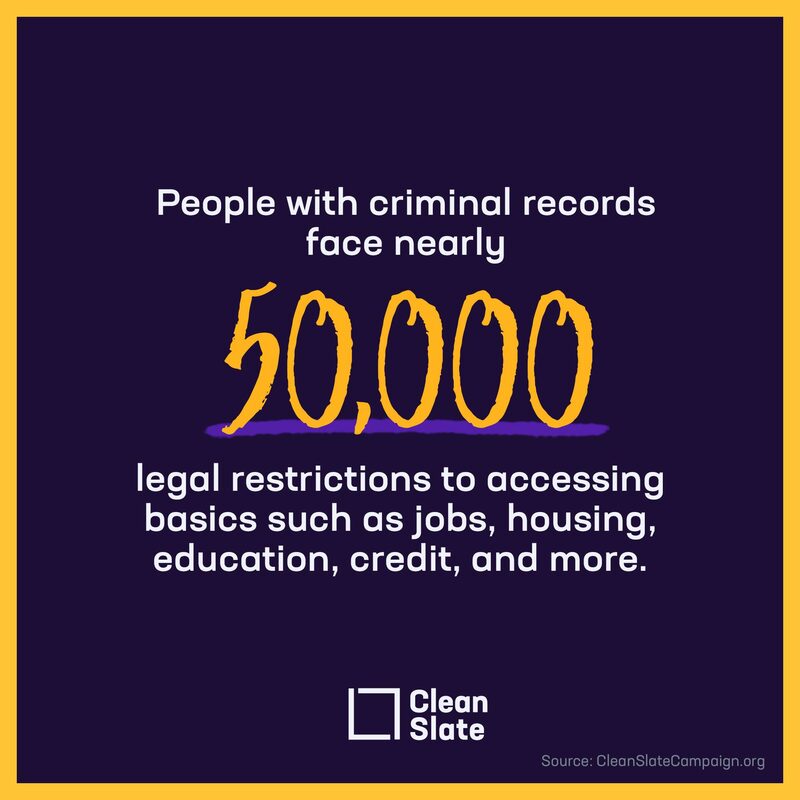 The clean slate policy model empowers states to automatically seal or expunge qualifying criminal records for people who remain crime-free for a set period of time. 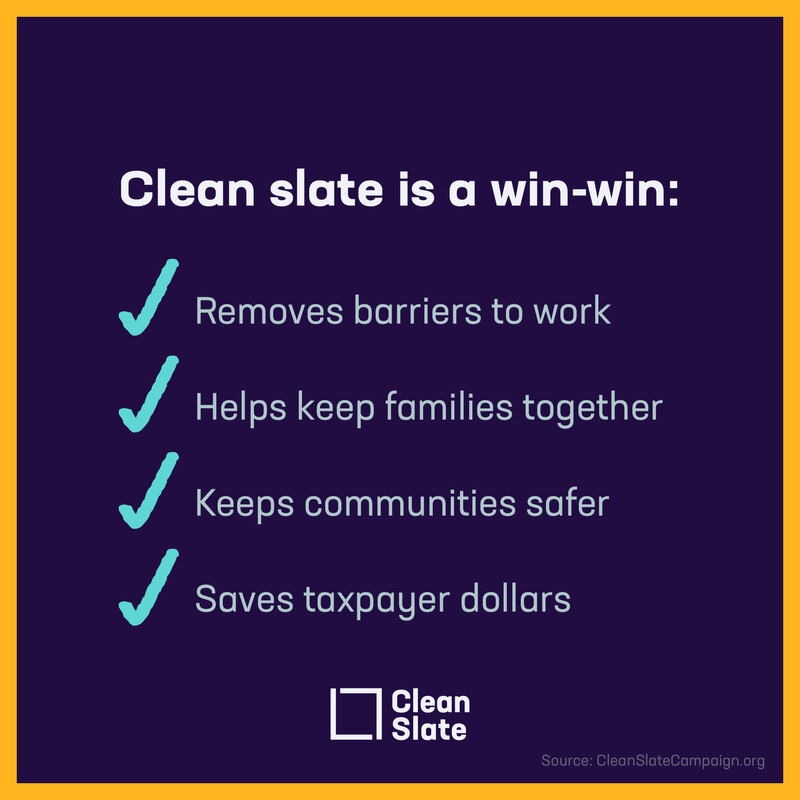 Clean slate helps people get the second chance they’ve earned by streamlining petition-based record-clearing—a costly and time-intensive process that prevents the vast majority of eligible people from ever obtaining needed relief. What happens once a record is sealed or expunged? A criminal record that has been sealed or expunged will no longer show up on background checks used by nearly 9 in 10 of employers, 4 in 5 landlords, and 3 in 5 colleges. Terminology often differs from state to state, but expunged records are generally destroyed, and records that have been sealed remain visible to law enforcement agencies, though hidden from public view. Record-clearing can be life-changing, removing barriers to employment, housing, education, and more, so people can move on with their lives. Research from the University of Michigan, for example, finds that people are 11 percent more likely to be employed and are earning 22 percent higher wages one year after a record is cleared. Who needs a clean slate—and why? Nationwide, between 70 million and 100 million Americans—1 in 3—have some kind of criminal record. Any record—even a decades-old misdemeanor or an arrest that never led to conviction—can make it nearly impossible to get into college, find a job, or secure a place to live. This does not hurt only people with records, but children and families as well. 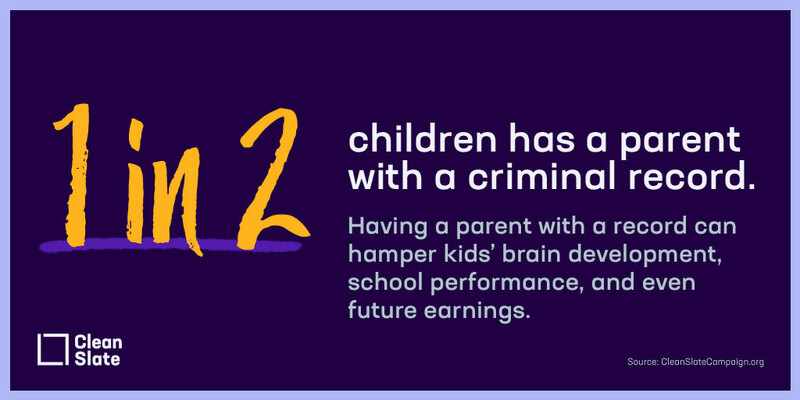 Nearly half of American children now have at least one parent with a criminal record, which can severely limit a child’s life chances, hampering cognitive development, school performance, and even employment and earnings in adulthood. Enabling justice-involved individuals to earn a clean slate will make it possible to move on with their lives, provide for their families, and have a fair shot at the second chance they have earned. Why do we need automatic record-clearing? What’s wrong with the current system? States generally allow for certain criminal records to be sealed or expunged, but under the current petition-based system, only a tiny fraction of eligible individuals ever successfully get their records cleared. Many do not even know it’s an option. And nearly all eligible individuals have to proactively file a petition in court—a process that can be both expensive and time-intensive. Petitioners generally have to hire a lawyer and take time off work to appear in court, often racking up thousands of dollars in legal bills and court costs. And the courts have to process each petition one by one, straining valuable judicial resources. Clean slate streamlines the process with the help of technology, making record-clearing automatic once someone has remained crime-free for a set period of time. Through clean slate, states automatically seal or expunge eligible records by computer query, meaning that everyone who qualifies for record-clearing gets the clean slate they’ve earned—regardless of whether they can afford a lawyer and expensive court fees and without having to navigate a complex court process. Where is clean slate happening? Who benefits from clean slate? Justice-involved individuals and their families will benefit, as they are able to earn a decent living, obtain stable housing, and access the education and training they need to get ahead. States will save taxpayer dollars as a result of reduced incarceration as the path to re-entry is smoothed. The nation’s failed experiment with overcriminalization has left between 70 million and 100 million Americans with some kind of criminal record. In the digital era, nearly 9 in 10 employers, 4 in 5 landlords, and 3 in 5 colleges use criminal background checks. As a result, even a minor brush with law enforcement—such as an arrest without a conviction—can turn into a scarlet letter that haunts you for the rest of your life.This doesn’t just hurt people held back by criminal records; it has ripple effects for children, families, and entire communities. Today, nearly half of American children have at least one parent with a criminal record. 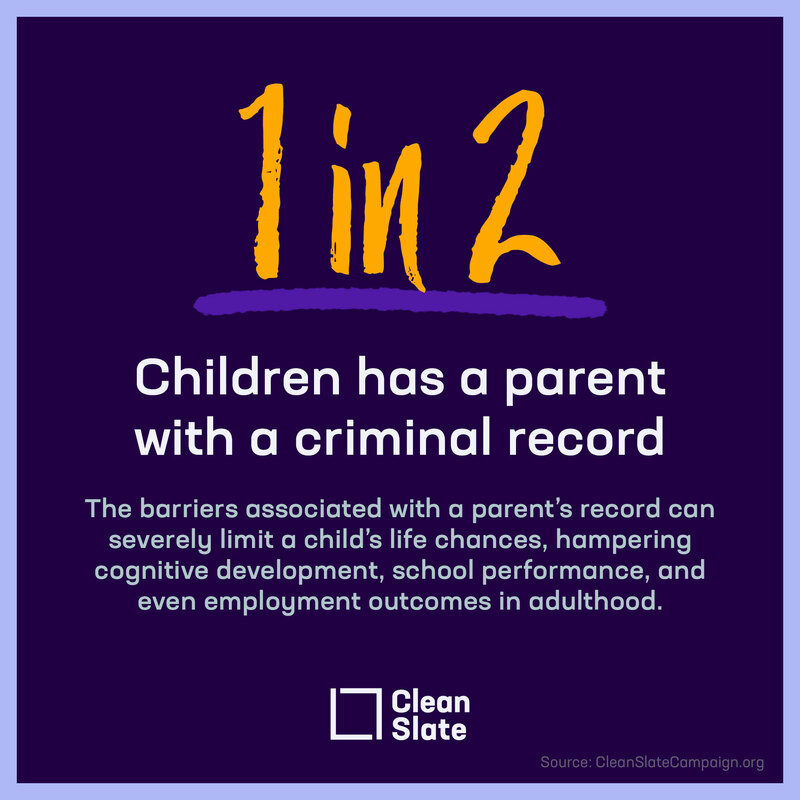 The barriers that come with a parent’s record can severely limit a child’s life chances, hampering brain development, performance in the classroom, and even how much they earn later in life. A new policy known as “clean slate” would allow people with criminal records to earn the second chance they deserve. Clean slate automatically seals or expunges certain records once people have proven their rehabilitation by remaining crime-free for a set period of time. If this sounds like common sense to you, you’re in good company. 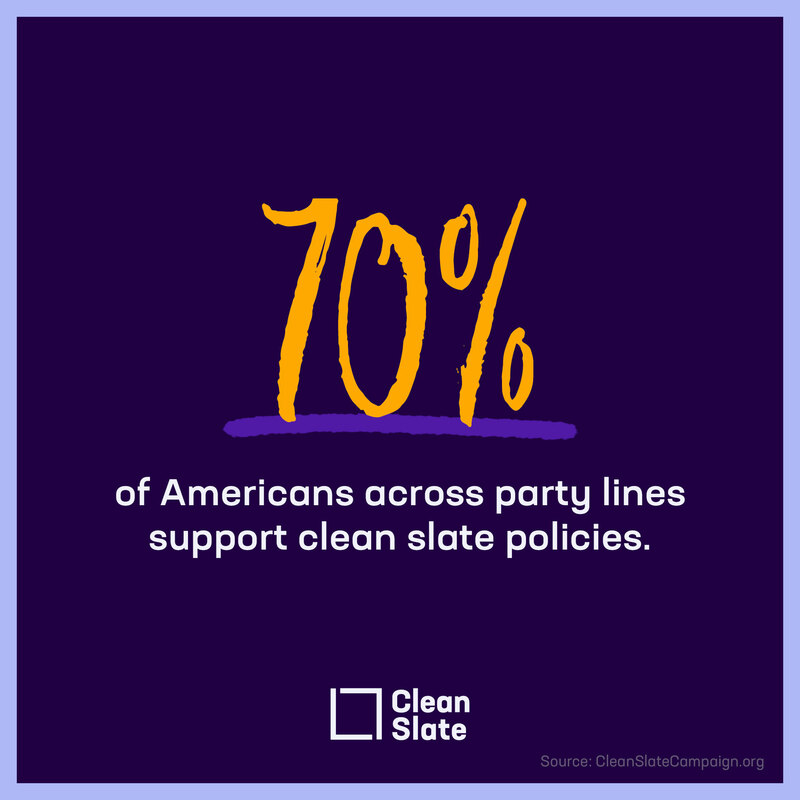 Seventy percent of Americans are in favor of clean slate policies, with support reaching all along the political spectrum. At a time when it seems political leaders don’t agree on anything, this is an area with rare bipartisan agreement. It’s a simple idea: Once someone has paid their debt to society, they deserve the chance to move on with their life, provide for their family, and contribute to their community. Enabling people with records to earn a clean slate can be life-changing. Research from the University of Michigan, for example, finds that a year after getting a record cleared, people are 11 percent more likely to have a job and are earning wages that are more than 20 percent higher than beforehand. Enabling people to earn a decent living also reduces the likelihood that they will commit another crime. That means safer communities, fewer people behind bars, and fewer taxpayer dollars wasted on unnecessary incarceration. It will also benefit our economy, which loses a whopping $87 billion in gross domestic product every year from shutting workers with records out of the labor market. And it will reduce a burdensome workload on our state’s courts, which currently must process huge numbers of record-clearing petitions one by one. That’s why in June 2018, Pennsylvania’s Republican-controlled Legislature teamed up with its Democratic governor to enact clean slate legislation. It’s also why several other states, including Michigan, South Carolina, and Colorado, are advancing clean slate initiatives of their own—and why bipartisan clean slate legislation was recently introduced in the U.S. Congress. A criminal record shouldn’t be a life sentence to poverty. It’s time [INSERT YOUR STATE] helped our neighbors with criminal records earn a clean slate. I have [#] children, [OPTIONAL: INSERT FIRST NAMES AND AGES], and I work as a [INSERT YOUR OCCUPATION, IF WORKING], but I’ve lost count of how many doors have been shut in my face because of a criminal record from [X] years ago. [SPECIFY IN ONE TO TWO SENTENCES WHAT YOU HAVE EXPERIENCED]. It shouldn’t be this hard to start over. And a mistake from the past shouldn’t define you for the rest of your life. 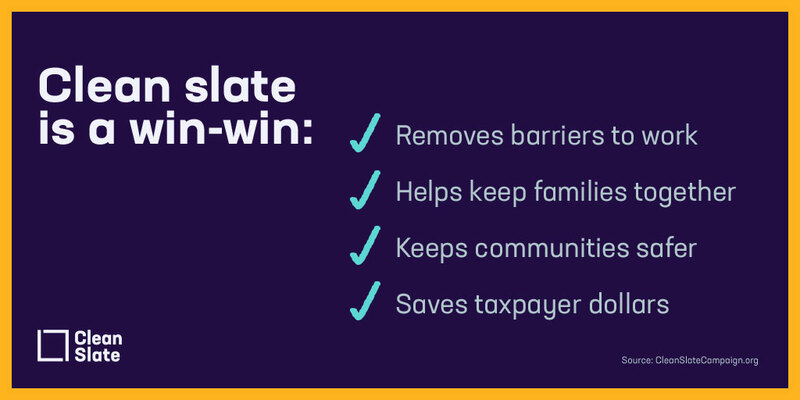 The Clean Slate Act would give [INSERT NAME FOR STATE RESIDENTS, FOR EXAMPLE, PENNSYLVANIANS] like me with minor criminal records a fair shot at finding a decent job, providing for our families, and becoming productive members of our communities. A criminal record shouldn’t be a life sentence to poverty. Studies have found that people with criminal records who have stayed crime-free for four to seven years are no more likely to commit a crime in the future than anyone else. It’s time [INSERT YOUR STATE] allowed me and others who’ve paid our debt to society to earn the clean slate we deserve. As a member of the [INSERT YOUR STATE] business community, I can tell you that the Clean Slate Act would be a game-changer for [INSERT YOUR STATE]’s workers and our local economy. Like many employers in the area, I’m facing a shortage of skilled workers, which gets worse by the day. 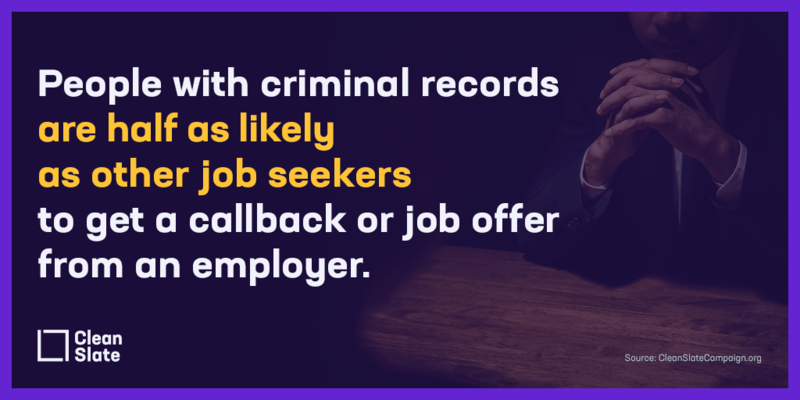 By helping workers with criminal records earn a clean slate once they’ve remained crime-free, qualified job seekers will be able to get back to work. 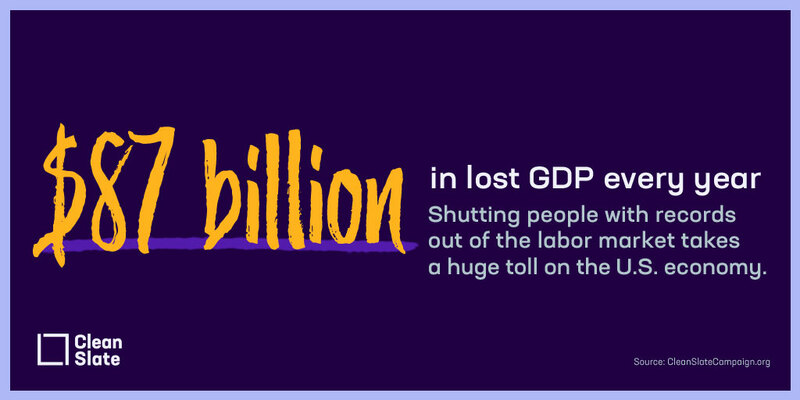 Employment losses due to criminal records cost our country up to $87 billion in lost gross domestic product annually. By helping our neighbors become productive members of our community, we have the chance to supercharge [INSERT YOUR STATE]’s economic growth, as people currently held back by a record are able to get off the sidelines and back to work. Enabling people to find work also reduces the likelihood that they will commit another crime. That means safer communities, fewer people behind bars, and fewer taxpayer dollars wasted on unnecessary incarceration. I urge [INSERT YOUR STATE] to support the Clean Slate Act to better our state for everyone. As a [TYPE OF SERVICE PROVIDER], I spend my days helping people with criminal records seeking to rebuild their lives. I can tell you from firsthand experience that even a minor, decades-old record can be a life sentence to poverty—standing in the way of employment, housing, and basically everything a person needs to get back on their feet. This makes zero sense. When people are able to find a decent job and stable housing, they’re able to move on with their lives, provide for their families, and become productive members of society. Research has found that a year after getting a record cleared, people are 11 percent more likely to have a job and are earning wages that are more than 20 percent higher. On the flip side, when people don’t get a second chance, they end up back behind bars. That’s why I support the Clean Slate Act. We should be making sure justice-involved individuals have a meaningful shot at a second chance—instead of setting them up for failure. Use these sample tweets to join the conversation about #CleanSlate. Consider pairing your tweets with social media graphics or linking to www.cleanslatecampaign.org. Even a minor brush with the law can create a lifetime of barriers to opportunity. 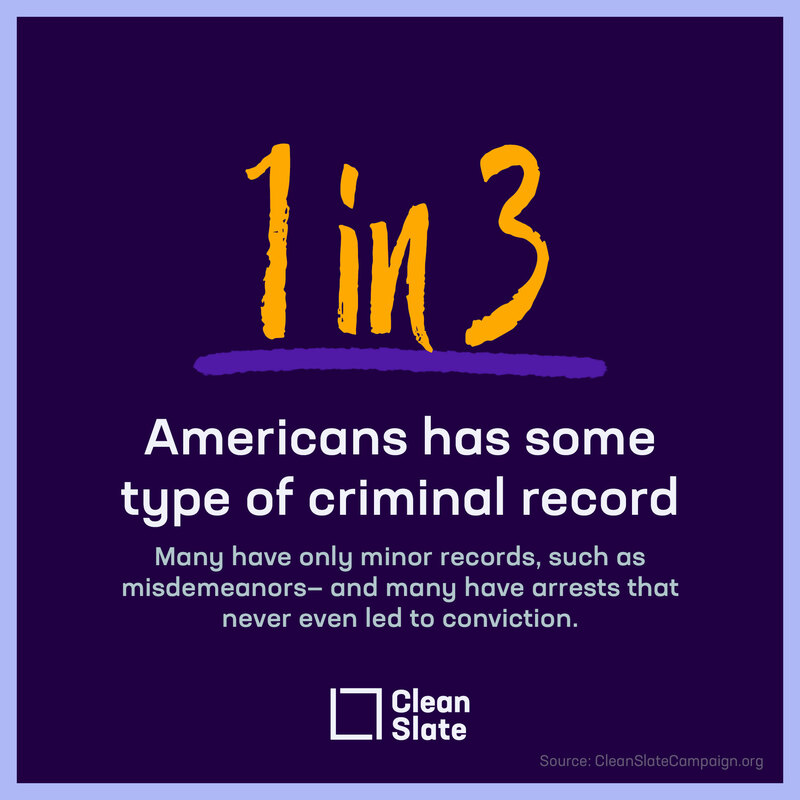 It’s time to give people with criminal records a #CleanSlate. A criminal record can be a life sentence to joblessness. #CleanSlate policies help people move on with their lives and get back to work once they’ve paid their debt to society. Criminal records can be a family sentence. Giving parents a #CleanSlate helps kids and families succeed, too. 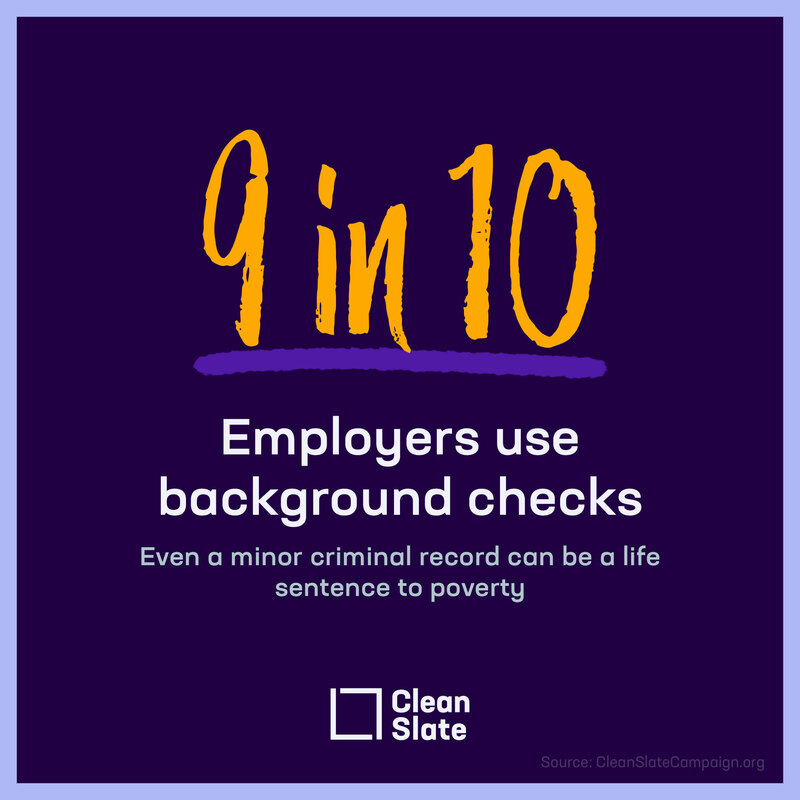 With a #CleanSlate people with criminal records can get back to work. That’s a win for the entire national economy. 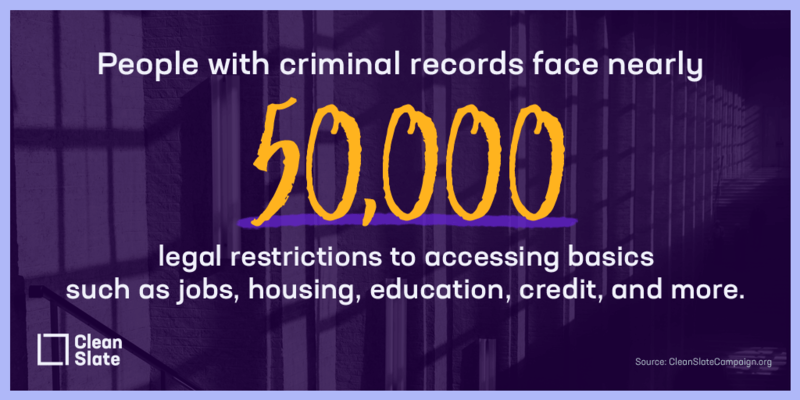 Only a tiny fraction of eligible people ever get their criminal records cleared. Many don’t know they’re eligible, can’t afford a lawyer, or get lost in red tape. A new bipartisan idea called #CleanSlate could change this. A criminal record shouldn’t haunt someone forever. It’s time we give people the #CleanSlate they deserve once they remain crime-free. It’s time to rethink the way we treat criminal records. 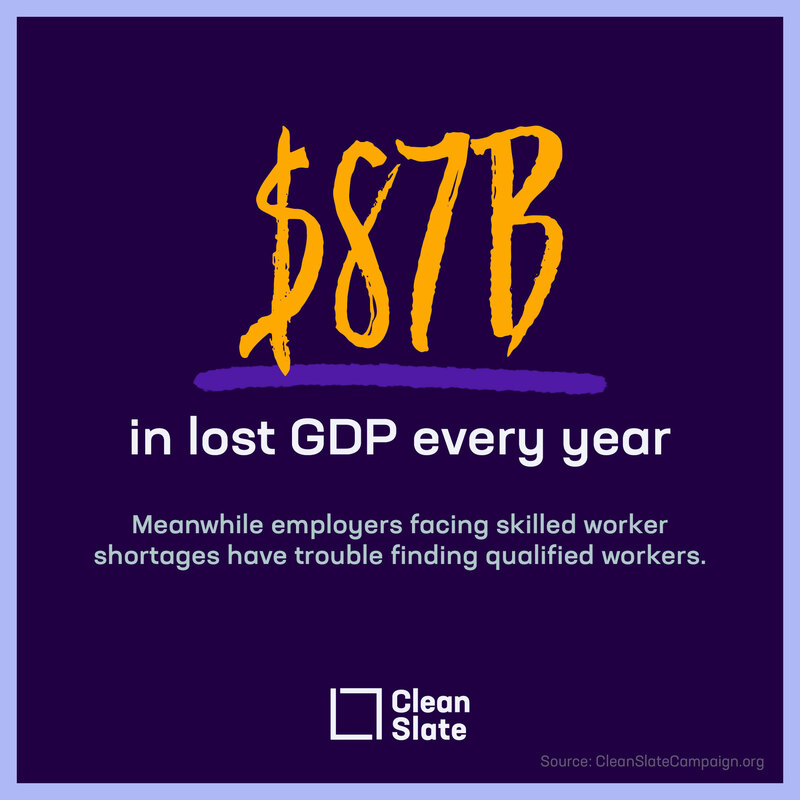 Automated record-clearing policies would give millions of people the #CleanSlate they deserve. Any criminal record—even an arrest that never led to conviction—can stand in the way of employment. It’s time to give people a #CleanSlate so they can get back to work. A criminal record shouldn’t follow you for life. That’s why states are taking action to help people with records get a #CleanSlate. People with criminal records who have paid their debt to society deserve a #CleanSlate so they can move on with their lives, get back to work, and provide for their families. 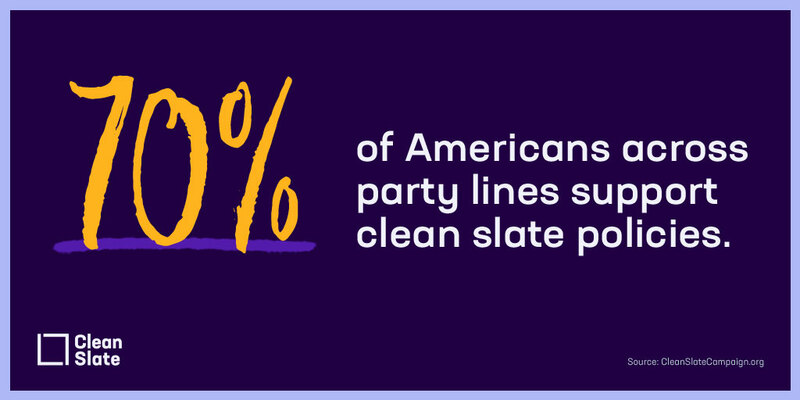 At a time when it seems Americans don’t agree on anything, #CleanSlate is something we can all support. After decades of mass incarceration and overcriminalization, 1 in 3 Americans now has some type of criminal record. It’s time to give people a #CleanSlate. The Clean Slate Toolkit is a product of the Center for American Progress. The clean slate automated record-clearing model was first developed by the Center for American Progress and Community Legal Services of Philadelphia. It is now supported by groups across the political spectrum and from a range of diverse perspectives. For a full list of partners who support clean slate, visit www.cleanslatecampaign.org. The Center for American Progress would like to acknowledge Rebecca Vallas, Betsy Pearl, Donovan Hicks, Areeba Haider, Sharon Dietrich, Zahra Mion, Jeremy Slevin, Chester Hawkins, Bill Rapp, Lauren Vicary, Shanée Simhoni, Mat Brady, Danielle Mathias, Rebecca Rosenberg, Julia Cusick, Mara Pellittieri, and Ed Chung for their contributions to this toolkit.